APGA presidential candidate John Gbor has condoled with the Governor of Sokoto state and the family of former President Shehu Aliyu Shagari who passed on Friday, December 28th, 2018 at the age of 93. The former President died in the National Hospital, Abuja after a brief illness as a patriot who wouldn't want to be flown abroad for treatment. Quoting Mary Macbeth, Gbor said: "Everyone dies eventually, whether they have power or not. That's why you need to think about what you'll accomplish while you're alive". Alhaji Shagari was born on February 25th, 1925 in Shagari village. He held several posts in Nigeria, prominent among them was when he was elected the President of Nigeria on the platform of the defunct National Party of Nigeria (NPN) as the first and only president in the Second Republic under the presidential system of Government. Unfortunately, Shagari's government was overthrown by the military junta of Maj-Gen Muhammadu Buhari on December 31st, 1983 on account of corruption. Gen Olusegun Obasanjo handed over power to Shagari following the controversial elections conducted by FEDECO in 1979, leading to legal tussle staged by Chief Obafemi Awolowo, the presidential flagbearer of the Unity Party of Nigeria (UPN). Alhaji Shagari also served several times in ministerial or cabinet post as a federal minister and Federal commissioner from 1958---1975. Buhari, who organized a putsch, a latterday democrat, teargassed the democratically elected Shagari government out of the corridor of power in 1983 and detained President Shagari without trial for many months under the harrowing condition in which Shagari nearly lost his eyes. Gbor notes that the patriotic zeal of Shagari in power would be missed for a season, despite some flaws induced environmentally. His exit evokes public pains and a loss to the nation still grappling with insecurity, poverty and gargantuan abuse of power and human rights. 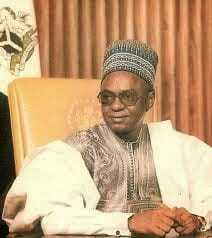 May God grant Former President Shehu Shagari Aljana fidau. Director of Strategic Communication, Gen John Gbor and Jerry Chukwueke Presidential Campaign Organisation APGA.